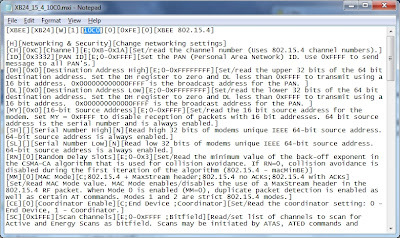 If you're like me and you've been working with XBee radios for a long time, then you may have encountered the 10C0 firmware problem. Some time in 2007-ish, MaxStream (now Digi) released a firmware upgrade for the XBee Series 1 (the 802.15.4 version), moving from version 10A5 to version 10C0. I diligently updated the firmware on all my XBees at the time, using the X-CTU configuration tool. Many years have passed since then, during which I probably got a new computer. And at some point when I tried to move on to even newer firmware (10ED is the latest as of today), I found that the 10C0 firmware had disappeared from newer versions of X-CTU. And, because all other evidence that the 10C0 firmware had ever existed was also gone, it was impossible to read from or write to the XBees with that firmware version. This also made it impossible to upgrade the firmware to a newer, supported version. Calls to Maxsteam/Digi were not very helpful - nobody seemed to know what version 10C0 was or why it had disappeared. The firmware list skips from 10A5 to 10CD. It's possible it was a buggy firmware and was taken down. Another story I heard was that it was a custom, OEM-specific firmware not meant for general release. In any case, it left me with a bunch of bricked XBees from the 2006 era. No seriously...a lot of freaking XBees. To be fair, they weren't complete bricks. They could still be used to talk to each other or to newer XBees with the same settings. They could also be configured manually through a serial terminal. They just couldn't be configured or updated with X-CTU, which is far more convenient. 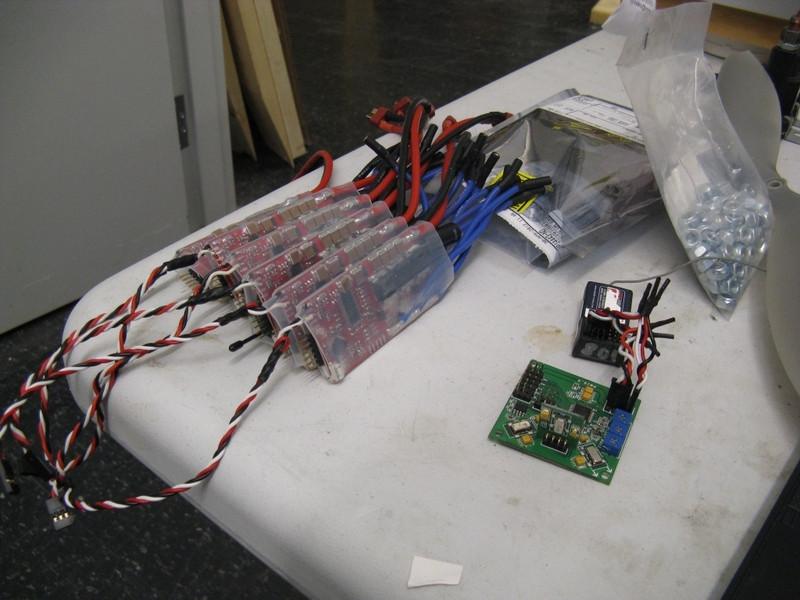 I still use them occasionally for simple projects or lend them out to people from whom I don't expect to get them back, but for the most part I have a bin full of not-very-useful 10C0 XBees. XB24_15_4_1xxx.mxi - XBee firmware version 1xxx. 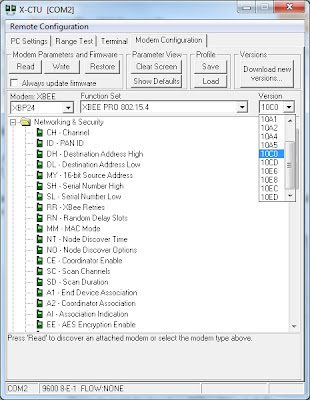 XBP24_15_4_1xxx.mxi - XBee Pro firmware version 1xxx. Change the highlighted text from 10CD to 10C0 in both files. After ensuring that you can read the parameters off the 10C0 radio, it's time the get the hell off that firmware ASAP. Change the Version dropdown to whatever the latest version is (10ED here) and check "Always update firmware", then Write the new firmware and parameters to the radio. I presume if you've made it this far, you know what's required for normal firmware updating. You need an XBee adapter that has the capability of updating firmware (DTR and RTS connected). It's a good idea do a regular firmware upgrade on a different radio as a test. That's it. Enjoy your newly liberated XBees. Get down from there, flux. You're not DC. You're not even a real measured quantity. The result of the integral form of the equation is the phase flux linkage. This, like back EMF, contains information about the position of the rotor. Unlike back EMF, it doesn't vary with speed, which makes it a nicer quantity to estimate in most cases. Doing an integration in software on real signals is not always practical. Ideally, the voltage and current are purely AC signals. But in real life they may have some DC offset for a variety of reasons. The current sensors may not be well-zeroed. Even so, the zero value may drift and there will always be at least some offset at the minimum resolution of the sensor. The voltage comes directly from the known PWM values, but it could also be biased due to rounding or other numerical issues. Any bias on the input signals would cause a pure integrator to ramp the output up to infinity. For that reason, it's common to implement an integrator as a low-pass filter instead. At high frequencies, the a low-pass filter with the appropriate gain behaves the same as a pure integrator. That gain happens to be exactly the same as the time constant. Another way to think about it is that it's a pure integrator in series with a high-pass filter. This lead to the same transfer function and behavior: integrating frequencies above cutoff but attenuating any DC bias. There are a few things to notice. One is that the current waveforms are offset by at least 1-2A. (Look at the maximum and minimum current on each phase.) With a nominal phase resistance of 46mΩ and a filter time constant of 6ms, that would lead to a flux bias of (2A)(46mΩ)(6ms) = 552μWb. This is almost half of the expected flux amplitude, and it shows in the flux waveform, which is shifted up by quite a bit. The flux estimator has a saturation parameter, set to 1500μWb, and you can see the top of the waveform being clipped in this data. The third, most unbiased flux estimate also produces the most uniformly-spaced and scaled current signals, which is probably a good thing in terms of efficiency. The flux zero-crossings will be evenly spaced, which should improve the position estimate and the FOC. Initial bench tests seem good, but I'm really looking forward to putting the improved version on all six ESCs and doing another CineStar flight test, this time with a Watt Meter. Sorry for the boring all-math post. But it was interesting to see an immediately obvious cause-effect relationship in this quick and simple fix. After some indoor test hops and flight controller tuning, I was ready to take the CineStar 6 outside to fly for the first time on custom motor controllers. Flying outside is a little more risky: while there are fewer things to hit, there's also the chance for it to fly away (and never come back). And then there's the wind. In this video, the wind wasn't too bad, about 5-10mph. But it definitely changes the way everything performs and I had to turn the gains down a whole arbitrary-notch-of-controlledness from what they were set to inside. 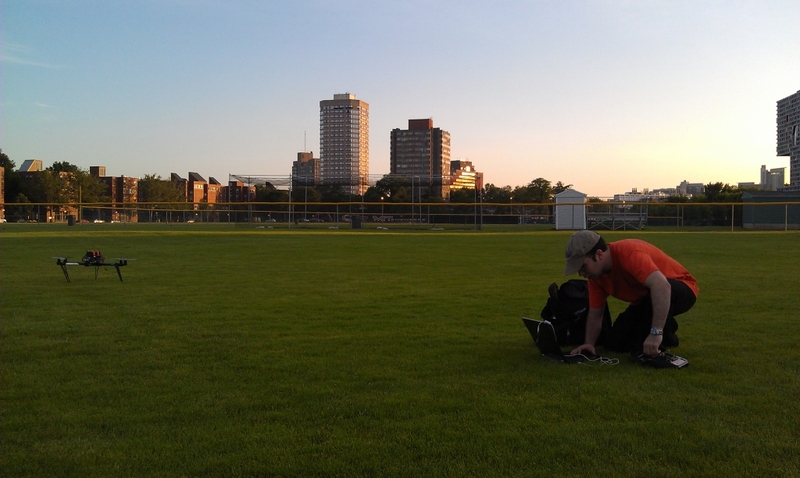 Flying outside also revealed another difficulty: taking off from the grass. You can see at the end of the video that for every successful take-off I had, there were several bloopers. The problem is the landing legs getting stuck, not allowing the frame to rotate as the flight controller attempts to stabilize it. As a result, motors spin up or spin down drastically trying to compensate, but they instead just make things worse and it tips over or stalls a motor. The solution is probably to take off faster, but I'm not up to that level of confidence yet. So, I patiently tried a few times and eventually stuck something flat under one of the legs to help it out. Once it was in the air, though, it flew very nicely. 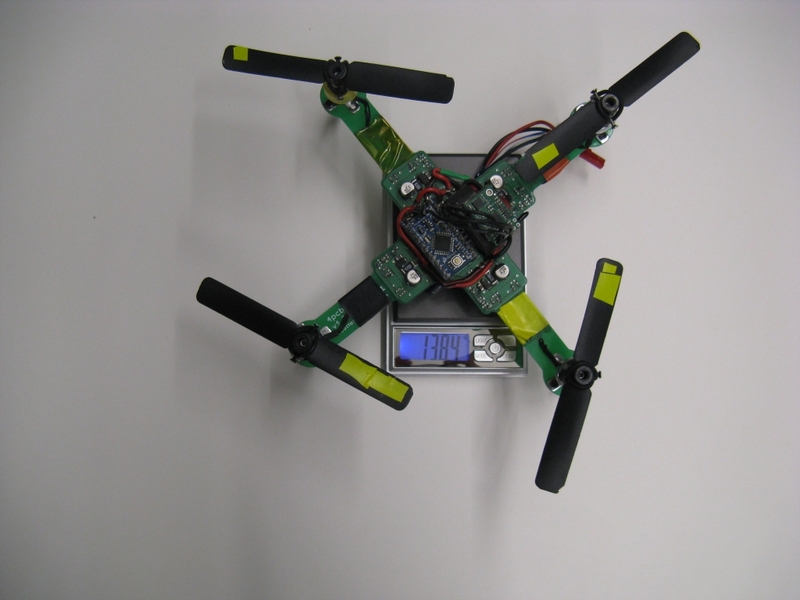 As flown, it was about 10.3lb (4.67kg). 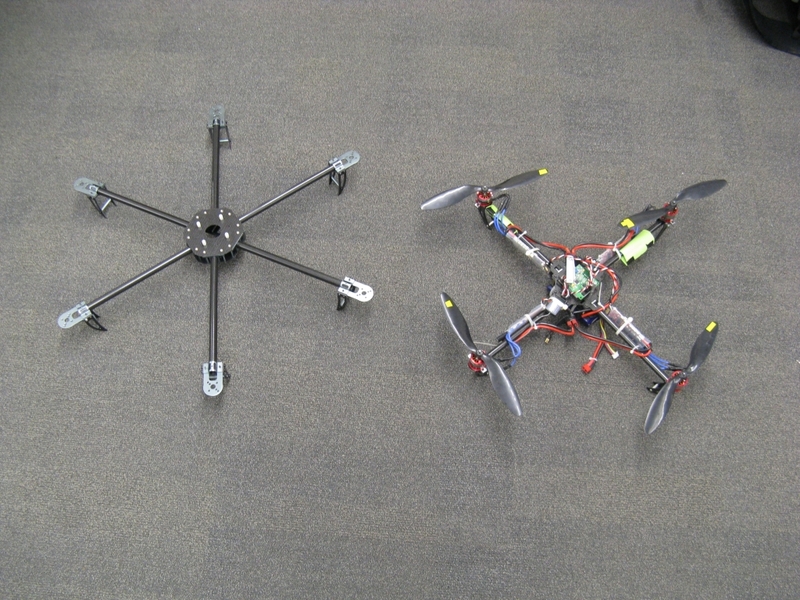 The shear mass makes it much less twitchy than the Talon quad I have, and more able to fight the wind. 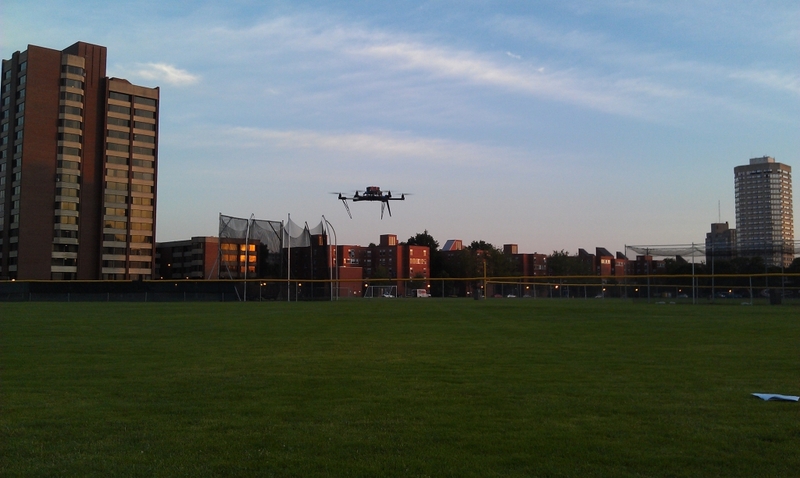 I didn't collect much data this time - just checking to make sure I can fly it. Other than somewhat unreliable startup exaggerated by the take-off problems, the motor controllers seemed okay. Next time out I will probably load it down with a camera, a Watt Meter, and maybe some supplementary landing gear that aren't like lawn darts. The rated maximum gross weight is 5.8kg. I won't be going very high, just because I'm not very experienced with flying it and it's a lot of weight to fall out of the sky. And all the load testing I need to do can be done below 20ft. On the other hand, I would like to get some nice video from high up. After testing one at the 2.007 final contest, I decided that the GoPro was an order of magnitude better than the cheaper camera I had and lighter than trying to lift my Panasonic HDC-SD60. So, I got myself a GoPro. For starters, I mounted it directly to the bottom of Kranmnikopter. (This is about two days after Kramnikopter had an unfortunate looping failure and was completely rebuilt.) The bottom mount will give a much better view than the top mount I tried previously, where you look through the spinning propellers. But, it meant moving the battery up top. 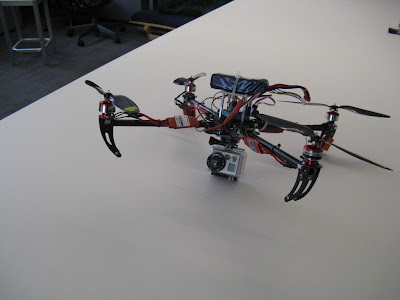 It also means that the camera is lower than the stock Talon landing gear. The video came out okay. I especially like the 720p/60fps option (the clips with no sound). 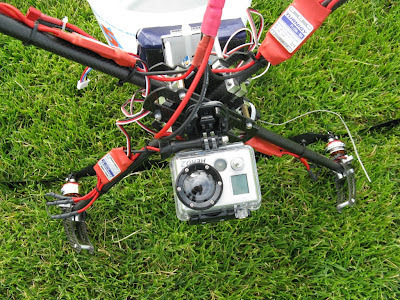 It makes the twitchy quad seem a lot smoother. There's definitely a noticeable waviness in this video that I didn't see in the indoor 2.007 video. It could be that the mount is different, or that the wind excites more vibrations at frequencies that bother the camera. (In the video, there's about a 10mph steady wind. Can you tell which direction?) I'll have to play with different types of foam mount to fix this. I also might look into a DIY lens change for the GoPro, since its narrow FOV options are not very useful. This weekend, I'll be taking the Talon + GoPro with me to North Carolina where there are actual trees and open spaces. Hopefully I can get some nice video. By contrast, my CineStar 6 is going to be a crude test mule for the motor controllers. For example, I may set the record for the highest airframe cost to flight controller cost ratio since I'll be using the same $15 KK Mulicontroller from HobbyKing that I've been using for Kramnikopter. I've already zeroed the gyros and calibrated the ESCs to this controller, and it saves this information in the ATmega328's EEPROM. So, even though I have to write new hexrotor firmware to the flash, I keep my calibration settings. KK board, receiver, and six FFv1.1s ready for action. 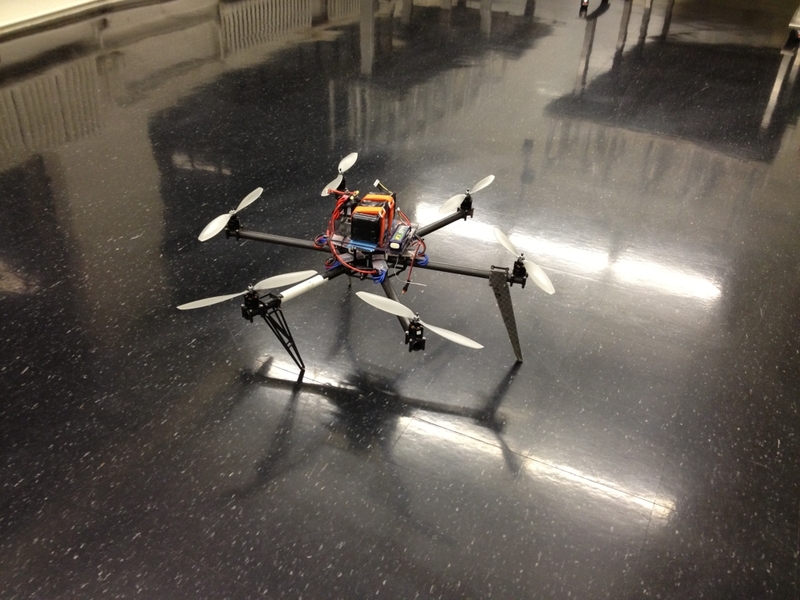 Yes, the KK board can do hexrotor control! 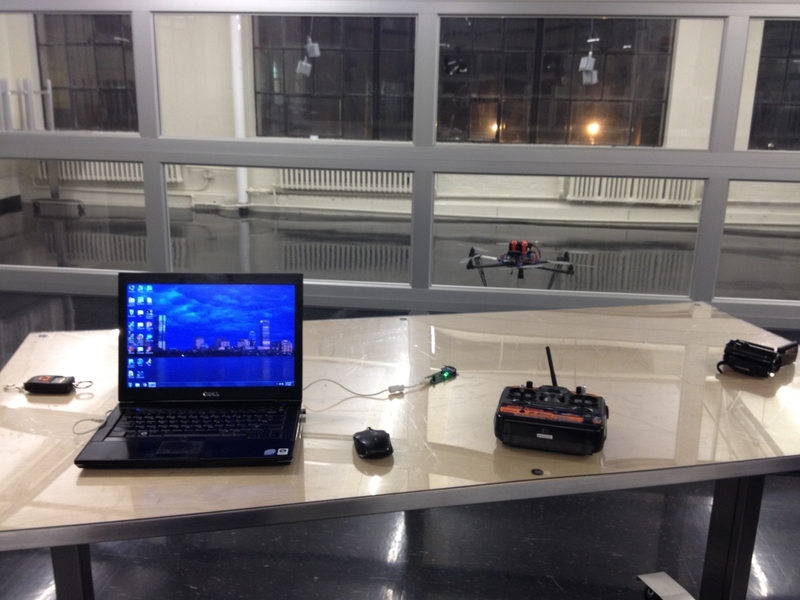 You have to find the firmware, which is not an easy task if you start from HobbyKing. 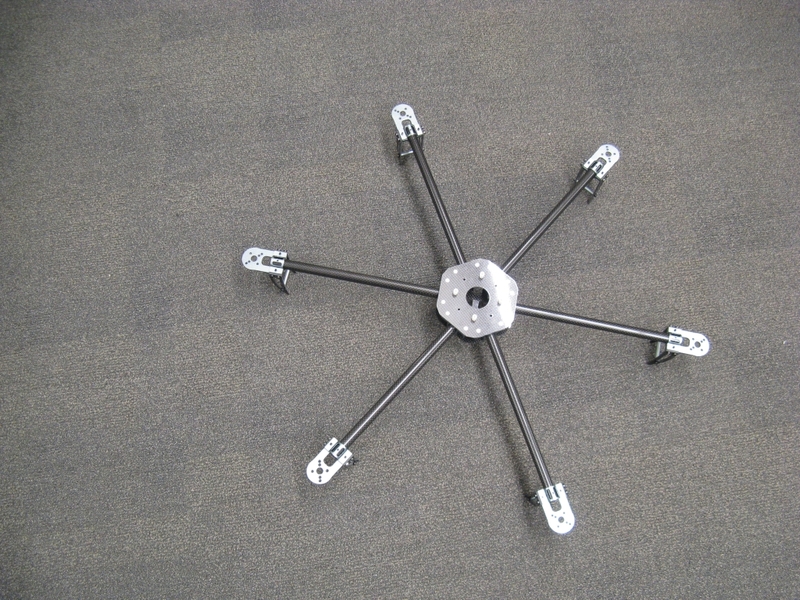 But, the latest version is available at the KK Multicopter site here. "XXcontroller KR v.2.0" seems to have all the firmwares in a single zip file, so you can find the configuration you need and upload it using whatever AVR programming tool you have. The C source isn't as up-to-date (I could only find v1.4 on that page), but it was still interesting to skim through. Battery pack, contactor, and power distribution bus. The contactor is run from a separate 4S, 1.8Ah battery that also powers the receiver. If the receiver loses signal, the contactor opens and the battery is physically disconnected from the motor controllers. This gives me a way to physically disarm the power system before approaching the hexrotor to unplug the battery or adjust something. I trust this a lot more than the KK board's software disarming feature, but if I were concerned about weight, a mechanical contactor would probably be out of the question. Small 50A automotive relays might be okay, though. In the first clip, the gains are a little on the high side, causing small oscillations which could go unstable when flying in ground effect or if a gust of wind disturbs the system. Turning the gains down made the flight less oscillatory, but also a little more jerky since the closed-loop tracking and attitude holding ability is reduced. I ran into a similar issue with Kramnikopter and the solution was to make the motor controller's input filter, which reduces noise on the PWM input from the KK board, faster. The faster filter had less lag and so the closed-loop system could tolerate a bit more gain without becoming oscillatory. With the CineStar motors, though, a faster filter has the potential to ramp the duty cycle so fast that the overcurrent protection is tripped, or the current sensors are saturated, either of which will cause a controller fault. In the test flight videos, the filter was a first-order discrete low-pass with a cutoff frequency of 5Hz. I will be trying some different types of filters, including a faster (10Hz) first-order low-pass and a non-linear slew rate limiter. I think the slew rate limiter might work best, since it attenuates large changes in input (ones that would cause overcurrent faults) but not small ones (like the closed-loop control signals). 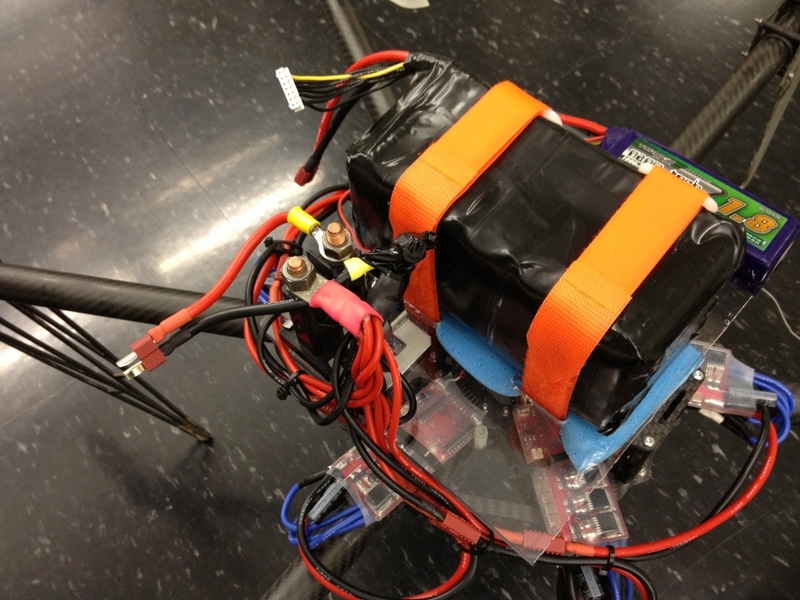 The hover speed is about 3700rpm for the 14x4.7SF props with a gross weight of about 4.76kg (10.5lb). The q-axis phase current for each motor is about 13A. I also installed a Watt Meter for the test hops. The average power draw for both flights was about 560W and the peak was about 630W. That's about 117W/kg average. All the signals are in the right place, and it looks relatively clean. But there's definitely some bias in the flux estimate - it's shifted up by about 0.250mWb and the only thing keeping it from going further is the cap at 1.500mWb. This could be due to bias in the current sensors, so a self-zeroing start-up routine for them would probably help. Otherwise, a faster flux estimator filter would also hold the waveform in place better, at the expense of low-speed performance. So many tradeoffs... So much motivation to start working on Sensorless Gen2. I finally got around to creating an Instructable for my PCB Quadrotor. 4pcb is a "low-level" build, perfect for people who don't like black-box components and want to do everything from scratch. 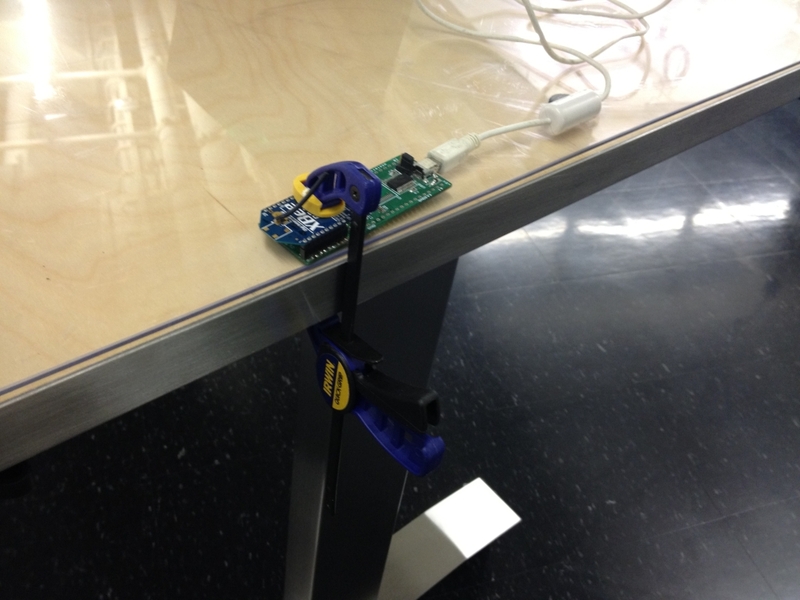 But it's also simple to put together and Arduino-based for easy coding. I'd love to see a swarm of them flying around some day, but I really want to see derivative designs, like a hexrotor version! I've updated the documentation on my own 4pcb page to redirect to the Instructable as the primary source of information for how to build it. 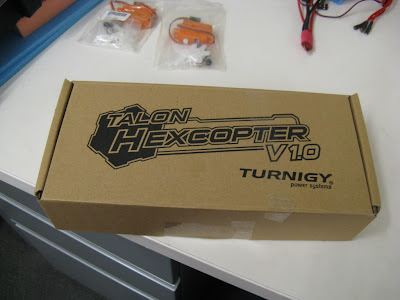 In other news, Talon hexrotor! For $75, you get about $300 worth of carbon fiber and machined aluminum parts that fit together into a 625mm hexrotor. I won't be doing much with it for a while, since I have to get my huge hexrotor flying with custom ESCs, but I couldn't pass up the deal.